I found this shelf at a local thrift shop last week. I have removed metal copper color knobs already in this "before" photo. This is actually the second one of these recipe book or kitchen type shelves that I have run across while thrifting. high school shop or industrial arts project at one time. On the first shelf, I added a piece of bead board to the back opening. You can see more of that makeover HERE. 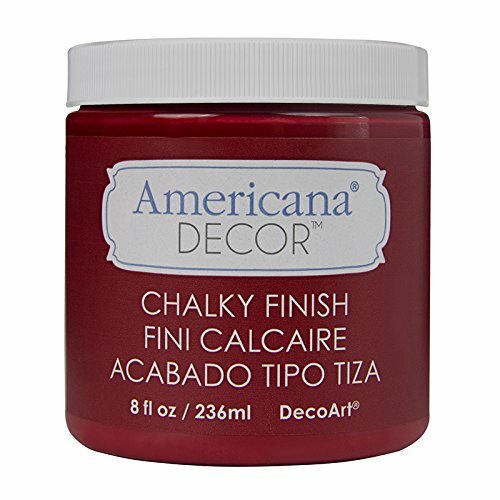 After cleaning the shelf number 2 with hot soapy, Dawn dish soap water, I brushed on a couple of coats of Deco Art Chalky Finish Paint in Rouge . I lightly distressed the edges of my shelf with 220 grit sandpaper. 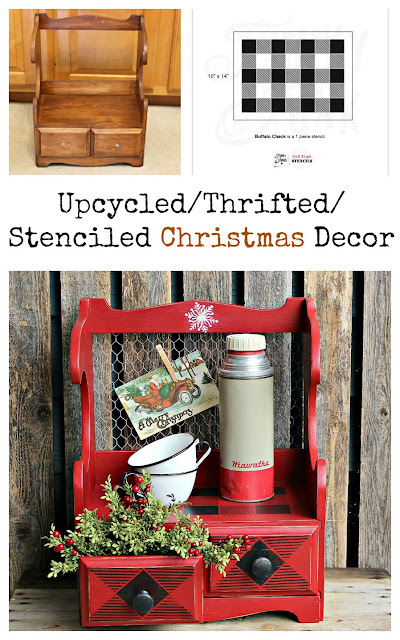 I'm still in love with my buffalo check Christmas decor from last year, so I'm pulling out my *Old Sign Stencils buffalo check stencil once again. I stenciled just a portion of stencil on the top of the shelf using Fusion Mineral Paint in Coal Black . 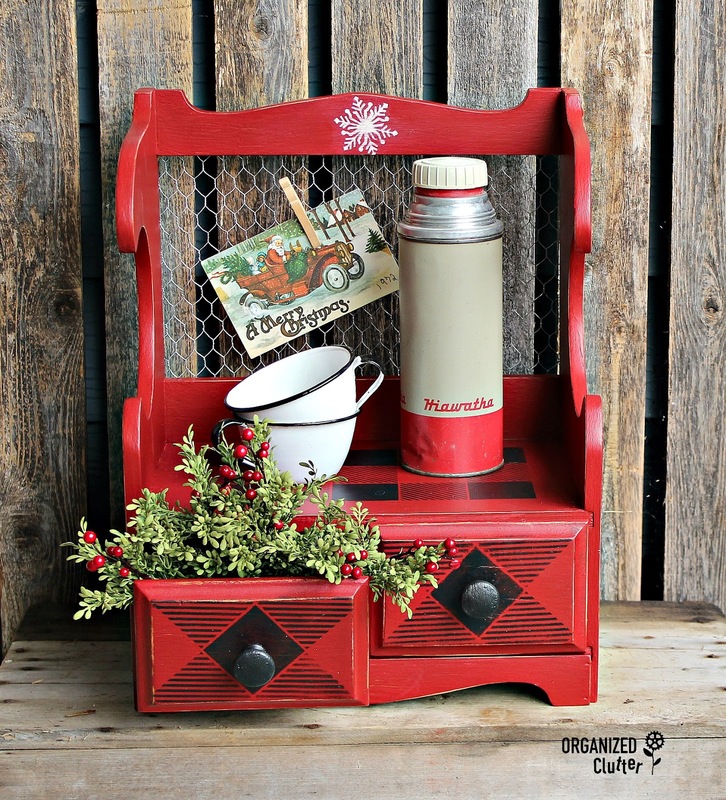 I stenciled the drawer fronts using the stencil on the diagonal. For shelf number 2, I used 1/2" hex chicken wire to fill in the back opening. As you can see, the wire is held on with staples. The drawer knobs were painted with coal black Fusion Mineral Paint as well, and the whole shelf was sealed with two coats of Varathane Water-Based Polyurethane in Satin Finish. 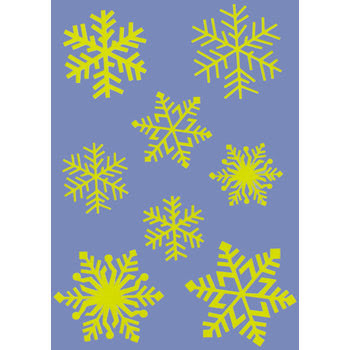 I used this Hobby Lobby snowflake stencil with very small snowflakes to stencil a snowflake in the top center. I used Fusion Mineral Paint in Champlain for the snowflake stencil. 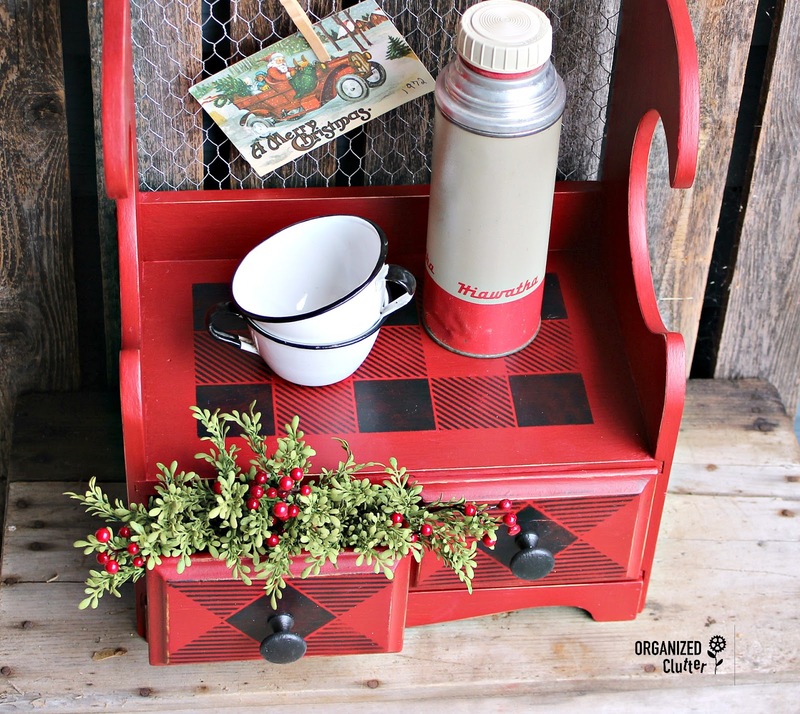 Then, all that was left to do was to accessorize my little red shelf. While red paint is perfect for Christmas time, this little shelf would work all winter. 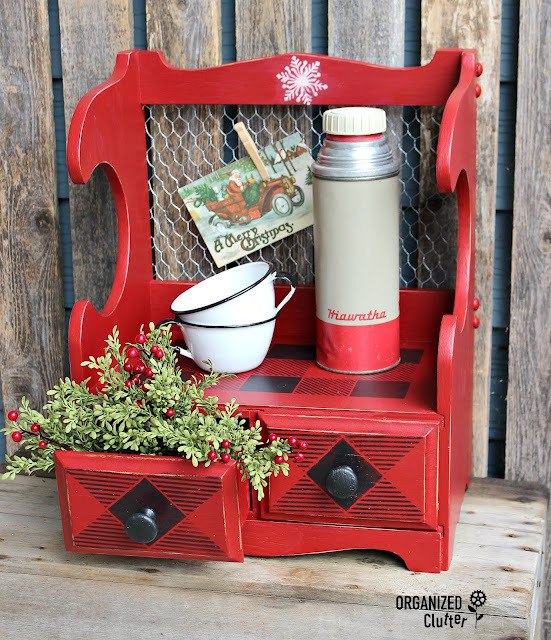 Start scouring your thrift shops for items to up-cycle as Christmas decor! 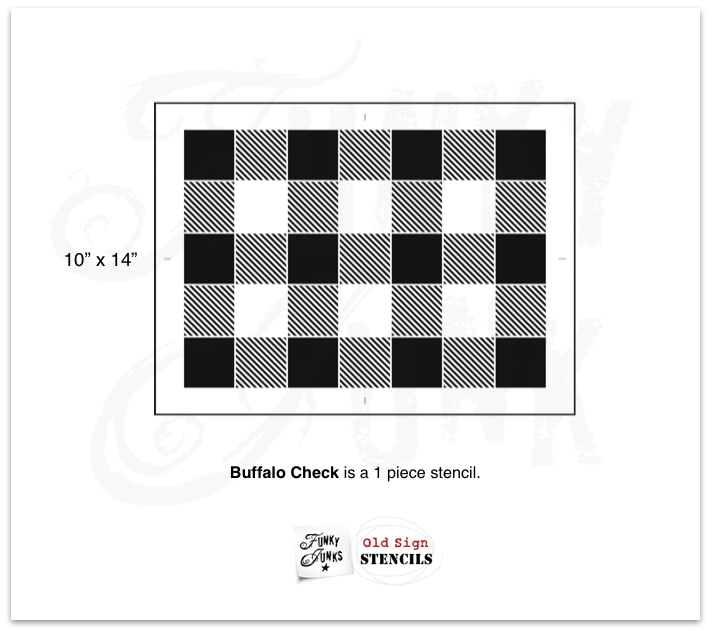 Get your own buffalo check stencil so you can stencil along with me! Love love both of them...gotta find me one now..doing the white with the wire when I find one..lol..you need an old plaid thermos your red one...thanks for always sharing your awesome ideas!! Your the bestest!!!! Crazy cute Carlene! You style your creations so well also! !